Covering live poker tournaments for a living affords me the opportunity to see countless thousands of hands played out, many of which offer interesting and potentially valuable insights into how players — both amateurs and professionals — play the game. In this ongoing series, I’ll highlight hands I’ve seen at the tournaments I’ve covered and see if we can glean anything useful from them. Last week, we looked over a hand from the 2016 World Series of Poker Main Event that aired on Episode 5 of the coverage. This week, there was one more hand from that same episode I wanted to discuss. The board read on fourth street, and with Konopelko bet 80,000. 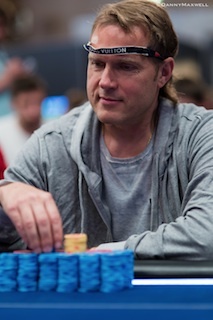 Niwinski, holding , called the bet, bringing the pot to 445,000. The river was the , putting five spades on the board. Konopelko bet again, this time 135,000. Niwinski raised to 455,000, and Konopelko folded, ceding the pot of a little over 1 million to Niwinski. This hand is a great example of how tournaments sometimes require adjustments on the fly. It also shows how it is important to have the flexibility to change a plan even within a single hand. For starters, Niwinski calls a small bet on the turn with a very marginal hand. He has to figure top pair might be best, and if not, there’s plenty of room to maneuver with position and possibly turn his hand into a bluff on the river regardless of what falls. Remember, Konopelko bet 80,000 into a pot of 285,000, and the players have plenty of chips back as each started the hand with well over 100 big blinds. Thus, Niwinski can call without fear that he’s going to be facing a massive, stack-altering bet on the river. This, by the way, is the “hammer” concept outlined by David Sklansky and Ed Miller in their book No-Limit Hold’em Theory and Practice. When the river brings the for a final board of , giving both players an obvious flush, things get really interesting. Konopelko decides to bet 135,000 into 445,000 — a very small bet. I don’t really like this sizing for the most part. It’s hard to see Konopelko betting like that with a big spade — wouldn’t he want to get some value from his hand, at least around half-pot? If he has a mediocre spade, he’s giving Niwinski more room to bluff him off of his hand with a big raise without committing too much of his stack. And if he has air, the same concept applies to a rebluff opportunity. Plus, some players might just shrug and call to try and chop. As for Niwinski, he springs into action, sensing he has a chance to turn his top pair into a bluff, and makes a nice raise to 455,000. If Konopelko actually has the , he’s going to let Niwinski know with a reraise and Niwinski can dump the hand, still comfortably sitting on a large stack. If Konopelko has any other spade, it’s a very tough call as Niwinski could presumably have plenty of big spades in his range given that he’s in the hand with a couple of Broadway cards as it is. This bluff would be a lot dicier if stacks were shallower, as Niwinski would have had less fold equity and would have been committing more of his stack, damaging his tournament equity if the bluff failed. But Niwinski correctly realized there was so much money behind that he could represent a variety of hands based on his opponent’s river play. Maybe he had the best hand, and maybe Konopelko would offer up a chance to turn his hand into a bluff based on bet sizing and reads. Niwinski showed how being flexible when in position with deep stacks can lead to profitable scenarios. They say it’s best to have a plan, and it often is. But be ready to adjust that plan when circumstances allow.